Bananas hang from a makeshift tree, the meat counter is gone, and customers bag their own salted fish. At 13,700 square feet, the newest Whole Foods Market in Boston is also one of the smallest. “We’ve had to go vertical. It’s been an adjustment for customers,’’ Mike Walker, store team leader, said on a recent tour of the two-month-old Jamaica Plain market. 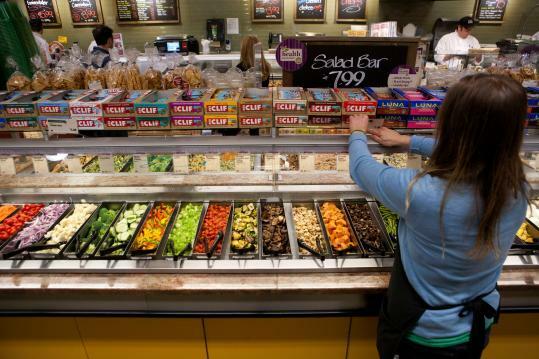 With Wegmans Food Market Inc. recently announcing plans to open in Newton and Walmart Stores Inc. setting its sights on Somerville, the convergence of major food chains zeroing in on the urban landscape presents a host of challenges. The companies want to tap these underserved markets, which typically fall in the city, but that can mean a radical redesign of their stores, a strategy that comes with its own risks when loyal customers are used to particular shopping experiences. Wegmans, based in Rochester, N.Y., is a company known for shopping on a grand scale, with sushi and thin-crust pizza served in bustling cafes. But it will cut its footprint to 70,000 square feet when it opens in the Chestnut Hill Square development, hardly small, but tiny compared to the chain’s 138,000-square-foot behemoth in Northborough. It is an equation most grocery corporations are contemplating as more people migrate from suburbs to cities. They are all “on the prowl’’ for city real estate, said Kevin Griffin, president of the Griffin Report of Food Marketing, a Duxbury trade publication. In the past 30 years, the urban grocery store landscape has changed dramatically. Cities once hosted a cadre of family-run markets, but they disappeared for a number of reasons, including the rise of convenience stores like 7-Eleven and Tedeschi Food Shops, said Griffin. The smaller stores that Wegmans and Walmart are building help extend their brands. “If you can have a Wegmans experience in a smaller footprint, people are going to dig that,’’ said Griffin. Even Walmart, the company most synonymous with superstore, has been building “neighborhood markets’’ about one-third the size of its big boxes. The company has proposed building a 34,000-square-foot store specializing in fresh food in Somerville on the site of a former Circuit City. The store’s layout will be two-thirds fresh food, and the rest dedicated to a pharmacy and health and beauty products, Restivo said. The Arkansas company has built approximately 155 neighborhood markets across the country and plans to double that number by 2013. “If you look at how the company started in rural America, folks did not have a choice. Flash forward five decades and urban customers don’t have a lot of affordable healthy options. We think our stores can be part of the solution,’’ said Restivo, stressing the company’s growth engine is still large-format stores. At the Whole Foods in Jamaica Plain, which is even smaller than its Symphony Hall location, there are plenty of parking spaces because many shoppers arrive on foot. The salad bar is condensed, and there’s no trail mix bar here or a place to eat. Meat is sliced and diced in a back room, and a butcher is summoned with the ring of a bell. “They don’t see the counter, but they see the service,’’ Walker said of customers. The store is committed to carrying local products, many made a few miles away at CropCircle Kitchen, said Walker. This is something mom-and-pop grocers like David Warner, co-owner of City Feed and Supply, have done for years. With two markets in Jamaica Plain, Warner has gone to lengths to reach out to customers by beefing up in-store tastings, offering wine and beer, and taking the shoppers’ pulse on products he carries. Steve Garfield, who lives a 20-minute walk from the Whole Foods in Jamaica Plain, said the store has changed the way he shops. He now stops in every other day for fresh food to prepare for his family that night. “This is exactly what they do in France,’’ he said. But there are a few things his Whole Foods doesn’t have. “We miss fresh bread,’’ said Garfield, referring to the lack of an on-site bakery. Another thing he misses: the Whole Foods cafe, where the self-employed Internet start-up consultant sometimes popped open his laptop to work. But the urban edition offers something its suburban counterparts, such as the 63,080-square-foot emporium in Dedham’s Legacy Place, can’t.